Café Barbera locations range in size from 750 to 2,150 sq. ft., and are defined in two unit sizes: Fast Casual Coffee Shop (1,614 – 2,152 sq. ft.) and Coffee Shop Standard (753 – 1,076 sq. ft.). Locations at the higher threshold of the range typically include a kitchen for cooking while the smaller size unit has an area for simpler food preparation, not cooking. Visibility, foot and vehicle traffic and surrounding businesses are all among the considerations when selecting an optimal Café Barbera site. That’s why Café Barbera does not have a cookie cutter business model for retail locations. Our outlets have been successful in a variety of locations, from storefronts to traditional malls. Café Barbera stores do, however, have some very important characteristics in common: No matter the location, there is the feeling of a classic Italian coffee house in all of our retail environments. The colors, décor, and high-end environment of the store, as well as the training and passion of our carefully-chosen teams, all converge to deliver “the good life” experience in each and every Café Barbera store. Each Café Barbera location – smaller fast casual unit or standard fast casual unit – is designed to transport our guests into a clean, comfortable environment that not only expresses our Italian heritage and passion for coffee and life, but tells them we sincerely want them to enjoy their time with us. We are proud of our concept, our heritage and our culture, and believe that everyone should have an opportunity to know and enjoy “the good life” as we do. 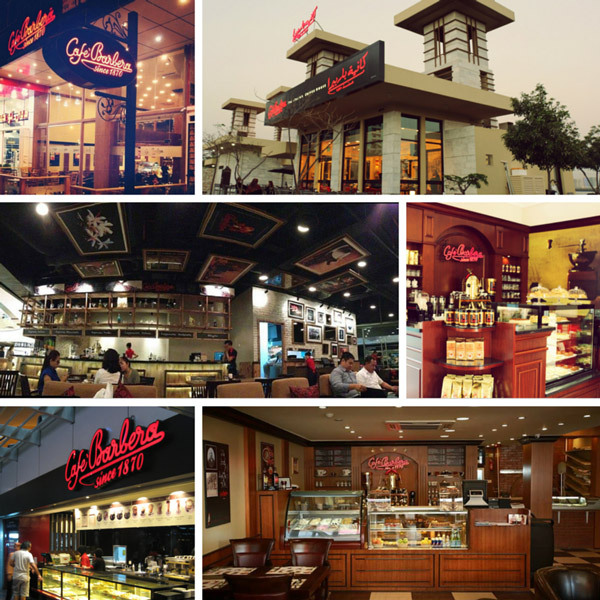 Since 2004, Café Barbera has operated a successful, internationally franchised coffee houses under the Café Barbera brand in the Middle East, Europe, Asia and Southeast Asia. Every element of décor, design, operating layout, personnel, drink and food selection, has been carefully chosen and refined through experience to provide an environment that delivers on the promise of our brand and tradition. The Café Barbera Competitive Brand Advantage – “Italianity” Many leading international coffee brands have a presence in the U.S. including Starbucks, McCafé, Coffee Bean and Tea Leaf. Other brands have made their mark in the beverage sector including Segafredo Zanetti, Caffè Vergnano, Corner Bakery Café and Cutters Point. Café Barbera’s unique positioning based on our history, passion and “La Dolce Vita” places us squarely in the higher end of quality and “Italianity” that separates us from the competition.